Encouraging children and young people to be interested in science can yield all sorts of rewards later on in life. One way to promote an interest in scientific and technical fields is to give STEM gifts for kids (STEM stands for Science, Technology, Engineering, and Math). Weather-related gifts can be especially accessible for children because weather is immersive and experiential– they see what the weather is like every day (it’s not an abstract concept). Here’s a great science gift for kids: a tornado simulator! This weather kit allows children to simulate tornados to learn about how vortexes work using water and a recycled bottle. Kids can put the kit together themselves (with adult supervision) and then run a “tornado experiment” which will wow family and friends. Battery powered (2 AAs not included). Requires a Phillips head screwdriver to assemble. This cute and bold “future meteorologist” shirt comes in both youth sizes and adult (men’s & women’s) and is available in various different colors as well. For a kid that’s super interested in weather, this could be a thoughtful gift (and something they’d love to wear). Support their curiosity about science and weather with this fun t-shirt. Solid color choices are 100% cotton. Classic fit. Also available as a hoodie. Written by a TV meteorologist, this weather book for kids explains how hurricanes, tornadoes, rainbows and other weather events work and why they happen. It also answers questions about how weather forecasts are made, includes DIY home experiments, and answers to frequently asked questions about weather phenomena like storms. This educational children’s book about weather also teaches about the difference between various cloud types. This weather station for kids can measure rainfall, temperature and wind speed in your backyard. It also teaches kids who are interested in weather about climate change, acid rain, the greenhouse effect, the water cycle and much more. This weather kit is a great science gift for kids. You can even grow “storm clouds” in the palm of your hand! Also includes a weather journal for your child to record the conditions in their area. Younger weather fans may not be able to use tools to study the weather, but there are other ways for them to learn about the world around them. This weather chart is perfect for toddlers and preschoolers who are interested in the weather. Each day they can observe the weather from their window or a trip outside and then select the figures that represent the conditions. The board has buttons to hand the figures on and pockets to keep the extras in. The figures include a sun, moon, kite, umbrella, stormy clouds, and more. As weather conditions change, they can swap out the markers. This is perfect for children who live in climates where you have all different types of weather in a single day. Here’s another science gift for kids: this kit offers 7 different hands-on experiments children interested in science can do. It includes the ingredients for making your own tornado in a bottle, a blizzard in a test tube, a tidal wave, snow, volcano, and more. Includes an instruction book with information about weather phenomena. If your child dreams of loading up in a truck and chasing tornados or is otherwise fascinated with storms, this is the perfect toy for them. Made by Backyard Safari Adventures, this mobile weather pod has all the tools you need to introduce your children to the science of storm tracking. Your kid will learn how to track wind speed and direction with the built-in weather vane and anemometer. There’s also a compass to help track wind direction. The pod also has a rain gauge and a thermometer for tracking real-time weather conditions. Since this weather pod is portable, it’s great to analyze the weather anywhere, like the park or your own backyard. The kit also comes with a collectible storm chaser patch and a field guide. Requires two AA batteries, not included. 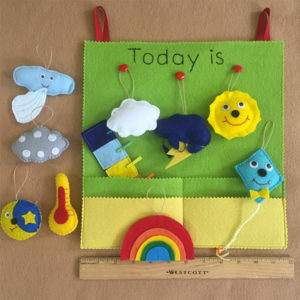 Perfect for preschoolers who are still discovering the joy of weather, this weather wheel helps them observe and categorized weather. Each day they can look out the window and turn the wheel to match the weather they observe. They can even change it if the weather changes. 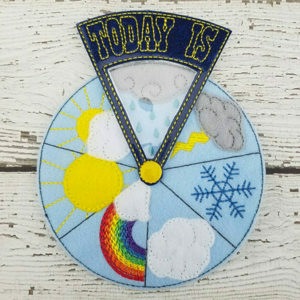 Handmade from felt, this weather wheel is 5″, the perfect size for little hands. Great for classrooms or home use. This science lab experiment kit for kids has dozens of activities in the fields of weather, physics, magnetism, chemistry, geology, biology and more. It includes a photo book with instructions for each activity and over 30 pieces for the experiments. The parts all fit back into a resealable ziplock bag so everything can be neatly put away after the experimenting is done. Here’s another great STEM gift for kids: a Magic School Bus themed chemistry lab. Kids can do sorts of science experiments and put them away in the school bus-shaped storage box. Includes instructions for each experiment on colorful cards, and all the accessories you need. Your “young scientist” will enjoy more than 50 experiments like measuring pH, making slime or sticky ice, bouncy balls, their own volcano, and more. If you’re looking for a science gift for teenagers, or advanced kids interested in weather, a home weather station might be a great option. This home weather station lives in your backyard or porch and can wirelessly send forecasts to your phone or a color base station inside. Pretty neat, huh? Weather enthusiasts use personal weather stations to offer super-accurate hyper-local weather information for their specific area (often microclimates or houses in between mountains have unusual weather patterns that broad TV weather forecasts don’t accurately reflect). For more home weather station choices, see our related article What is the Best Wireless Anemometer & Wireless Wind Speed Meter?. This shirt is the perfect gift for anyone who can’t wait to run out and jump in puddles after a rainstorm. Or for those kids who refuse to come in and want to dance in the rain. 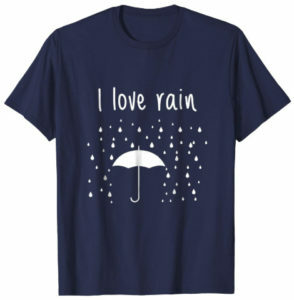 With a cute illustration of an umbrella and raindrops, this t-shirt proclaims: I love rain! With adult and youth sizes, this is perfect for kids of any age who enjoy a good summertime thunderstorm. Get it as a gift for aspiring meteorologists, storm chasers, and weather enthusiasts. Available in navy & royal blue. Can you recommend a weather book for kids interested in science? National Geographic’s “Everything Weather” book for kids is a great place to start. It has plenty of great photographs and information about weather phenomena (64 pages long, recommended for ages 8-12). Browse other weather books for kids here. How important are the age recommendations for these gifts for kids interested in weather? Many of these science gifts for kids have small parts that can present a choking hazard for children under a certain age so we’d recommend taking the manufacturer’s age recommendations seriously. Wind and Weather Tools helps you pick out the best home weather stations, anemometers, and other weather gauges like rain meters, wind meters and more.